LOS ANGELES – If it can happen at the White House, it can happen in any house. 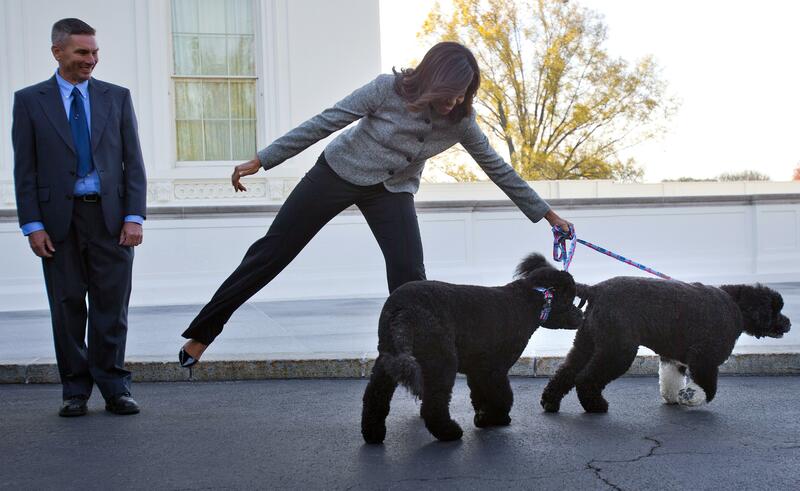 Sunny, the Portuguese water dog who joined fellow first dog Bo and the Obama family in 2013, has housetraining issues. “We’re dealing with that problem, but she sneaks and does it,” Michelle Obama said in December. Housetraining problems are one of the biggest reasons people return dogs to animal shelters. So it’s important that dog-owners understand why dogs have accidents and how to remedy the problem. “Not all owners are like the Obamas, approaching their dog’s problem with patience,” said Dr. Lisa Radosta, a board-certified veterinary behaviorist for the Florida Veterinary Behavior Service. Here’s some advice on why dogs have accidents and how to handle it. Lexie, one of Radosta’s puppy patients, was given too much freedom to go wherever she pleased, so she was never properly housetrained, Radosta said. Her owner had to start from scratch. Dogs must learn to urinate and defecate outside from the beginning, on grass, sidewalk, gravel or whatever surface they will be using. And they need to be monitored so they don’t make mistakes. Housetraining should start when puppies are 7 or 8 weeks old. If you can’t walk the dog on a regular schedule, hire a dog-walker or use doggy day care. Keep dogs on a leash until they’ve done their business: no running or chasing balls first. And always reward success. Carry treats so you can give the reward outside instead of encouraging the dog to hurry back inside. Dogs also won’t know why you’re angry if the accident happened earlier in the day. Dogs who are used to wee-wee pads may resist doing their business outside. If you plan to keep the dog primarily indoors, if it’s very small, or if you live in a high-rise and won’t be taking the dog out on a regular schedule, then you might prefer the pads. But if you expect the dog to go outside, don’t introduce the pads. Commit to regular walks from the start. If you must provide an indoor option, products like DoggieLawn, which is basically a patch of grass in a box for dogs, may help reinforce the message that grass is OK, but the floor is not. The vet saw a golden retriever who was scared to death of the doggy door. So if the owner wasn’t there to let her out, she wouldn’t leave the house to go on her own, Radosta said. Some dogs are afraid of the dark. Rain, thunder, mud, ice or snow will stop others at the door. Some dogs have separation anxiety, Radosta said. They have accidents when their owners leave the house. Dogs get canine cognitive dysfunction syndrome or the dog version of Alzheimer’s disease. You might take your dog out just like you have for 10 years. But instead of doing what it’s always done, it might look around, see a lizard or squirrel and forget why it’s out there. Your dog may have a urinary tract infection or may need treatment for diarrhea. Especially if you’ve just adopted a pet or there’s been a change in your dog’s habits, see a veterinarian to rule out medical issues and discuss diet. Mia is an 80-pound Rottweiler that is so fearful, “the whole world is scary except the inside of her house,” Radosta said. She has been using wee-wee pads since she was very small. Radosta and the owner have talked about re-training, but they’ve decided to leave things the way they are. Club soda and products like MisterMax Anti-Icky Poo, Urine Off and Febreze Pet Odor Eliminator may help remove stains and smell.